Our press outlets reported also that Sidney Toledano, Christian Dior’s Chief Executive, suspended Galliano immediately. For some reason, not a single press outlet except the Jewish Chronicle was kind enough to share with us the fact that Sidney Toledano was actually the bearer of the ancient Jewish Sepharadi Toledano family. When I initially read about the Parisian bar ‘anti Semitic incident’ I was expecting Galliano to be a pretty scary skin head, I envisaged murderous eyes, Nazi tattoos, a baseball bat and a leather jacket. But then a video of the event came out. And I just couldn’t stop myself laughing. 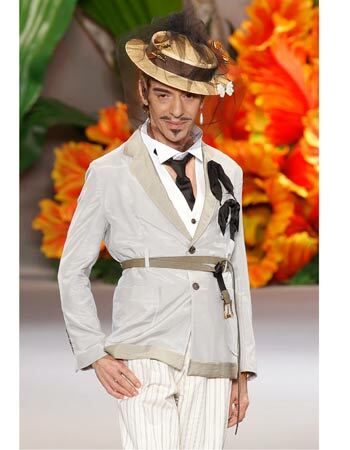 In the video Galliano seems to be an eccentric fragile sparrow. He is certainly drunk and lonely. He is harassed by more than just one giggling woman who seems to be having a good time on his expense. Unlike the so-called ‘deniers’ who question the gas chamber narrative, Galliano actually affirms it all. I guess that some people happen to love Hitler when intoxicated. I can certainly think of many others who worship Blair, Netanyahu or Stalin when sober. They are far more dangerous as far as I am concerned.